I have been doing a lot of Asian food lately and I asked Jan if she would like roast chicken. Of course, she said, “Yes,” and she said she wanted coleslaw to go with it. I also had some marble potatoes that I decided to roast at the same time I cooked the chicken. I am still not sure about brining. The first time I tried dry brining, I ended up with an expensive turkey that was too salty to eat. This has left me very shy about brining poultry. Another problem I have with most of the recipes for brining is the massive waste. Using a cup of salt in a gallon of water always seemed excessive for one little chicken. I knew there had to be a better way. One gallon is 16 cups and one cup is 16 tablespoons. With such an easy scaling of measurements of water to salt, I decided I that could use as much or as little liquid as I needed. Two or three cups of liquid should be enough to cover a chicken with the brining solution. The trick here is that you do not brine in a pot, but in a plastic bag. Jan called this “drought brining,” because we are having a water shortage here in California. To add some flavor to my solution, I decided to add some brown sugar, dried rosemary, and black pepper. After Dinner Note: This technique produced a very moist bird with crisp skin. I may have to give up my bias against brining. 1. Put the brining ingredients into a 2 cup measuring cup and add one cup of boiling water. 2. After the sugar and salt has completely dissolved, add one cup of cold water. 3. Rinse the chicken and out it in a gallon plastic bag. 4. Pour the bringing solution over the bird. Tip: Be sure to get the pepper and rosemary bits both inside and outside the bird. 5. Rinse the measuring cup out with one more cup of cold water. 6. Put the plastic bag into a mixing bowl. 7. Squeeze as much air out of the bag as you can and seal it. 8. Use a rubber band to gather the top of the plastic bag together. Tip: This should bring the brining solution completely over the bird. If it does not, add a bit more water to the bag. 9. Refrigerate the bird for 4-12 hours. Tip: Turn the bird over every few hours to redistribute the herbs and pepper. 10. Drain and pat the bird dry with paper towels. 11. Mix the oil, rosemary, and pepper and rub it on the bird inside and out. 12. Seal the cavity with a toothpick and truss the legs. Tip: Pull the skin on both sides of the cavity together and insert a toothpick through the skin several times to hold it together. Lift the tail and spear it with the toothpick to finish closing the cavity. 13. 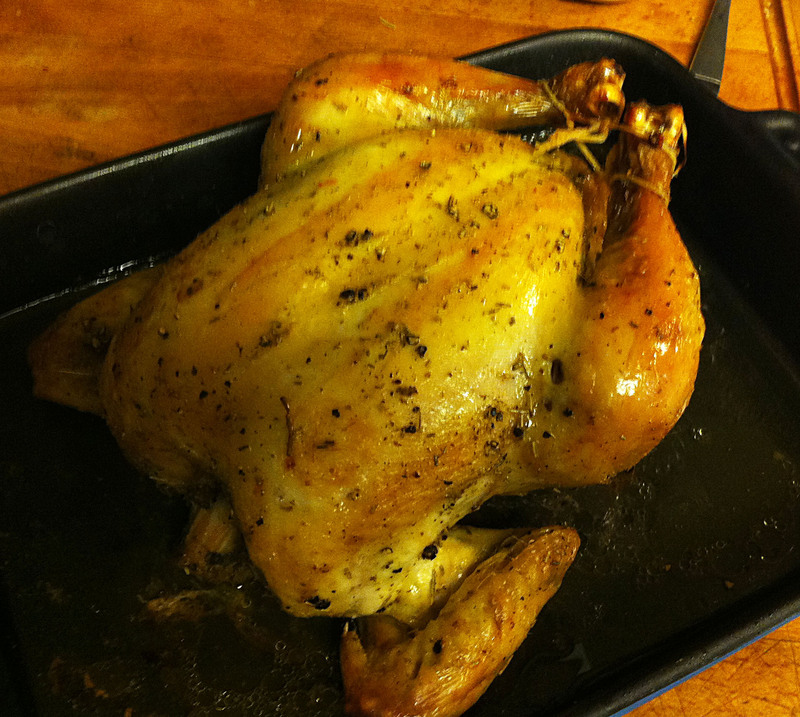 Put the bird in a shallow roasting pan and put it in a preheated 450° F oven for 20 minutes. Tip: I used an attractive casserole, so I would not have to transfer it to a serving platter. 14. Rotate the bird and reduce the heat to 350° F. Insert a constant read thermometer into the thickest part of the leg. 15. Set the thermometer alarm to 165° F and continue roasting until the alarm sounds, about 30 to 40 minutes. Tip: I was roasting a three and a half pound bird. A larger bird will take more time. 16. Remove the bird from the oven and tent with foil. Let it rest for 10 minutes.